Suit up with a selection of the coolest jetpacks ever made and take to the skies as Barry Steakfries, the lovable hero on a one-way trip to adventure! Join Barry as he breaks in to a secret laboratory to commandeer the experimental jetpacks from the clutches of science evildoers. Rain bullets, bubbles, rainbows and lasers downwards as you fly towards higher and higher scores! Along the way you’ll collect coins, vehicles, powerups and more, all of which can be upgraded and customized in the Stash. Want to dress up like a ninja? Paint your Profit Bird gold? Grab your robot pal Flash to come along for the ride? The choice is yours! 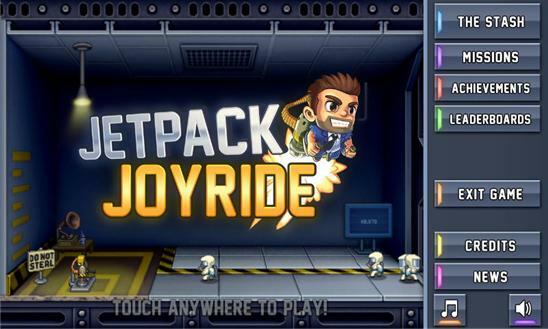 Stay alive, get funky and lose yourself in Jetpack Joyride. There's so much to see and do, all the time in the world and more than enough jetpacks! As always, Barry Steakfries will provide!